I made a decision last September to try swimming in togs rather than a wetsuit. 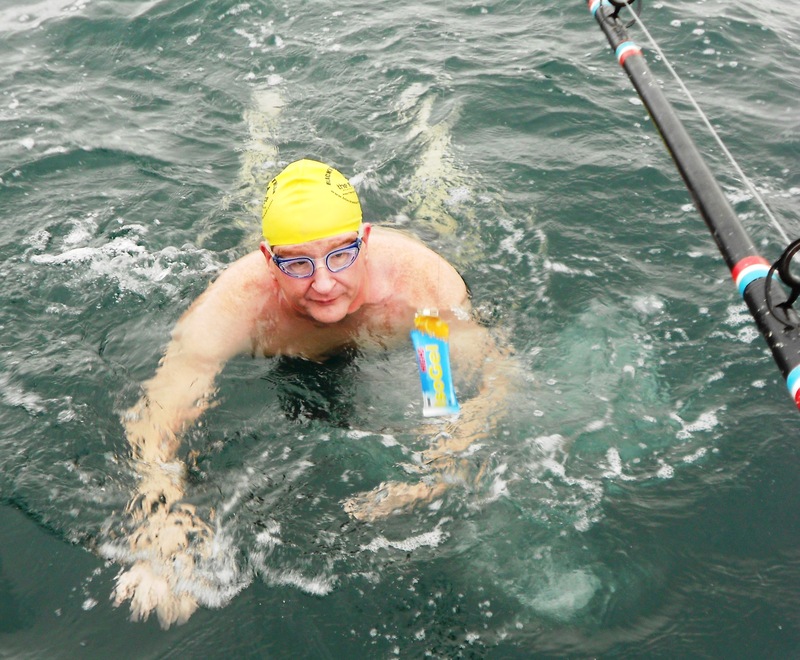 Bernard Lynch was planning to swim 24km from Sandycove to Myrtleville and I said I’d work to go with him. Learning to swim without the aid of the wetsuit led to a frustrating Winter. Following Craig Morrison’s advice (summary: swim in cold water – a lot) I plodded along and Bernard swam loops around me. Fortunately for me, I seem to have a reasonable cold tolerance. Swimming in Myrtleville four or five times a week all Winter reinforced it. On the downside, it also reinforced the now commonly-held view that the Lynch fella and the tall guy with him are mental. Ask anyone in Crosshaven. 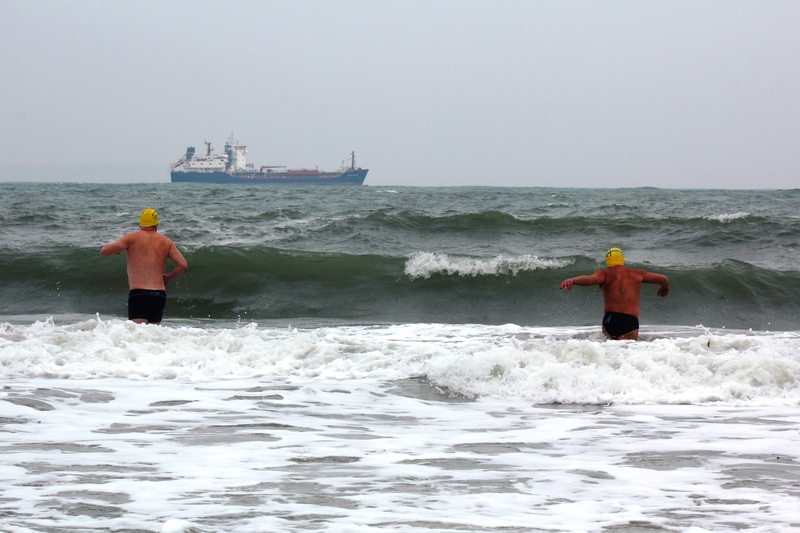 Race you to the ship – not a lot of people swimming in Myrtleville on days like this. We picked our week to avail of spring tides – August 20-24. The weather didn’t co-operate so we went for Monday, August 26. The tides weren’t ideal but the weather was pretty good. 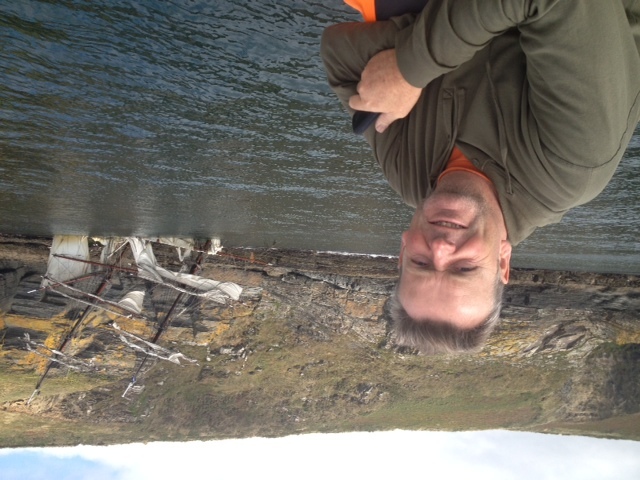 Fantastic crew again – Tom and Frank Lynch in Bernard’s RIB, Tom McCarthy and Billy Kelleher looking after me. 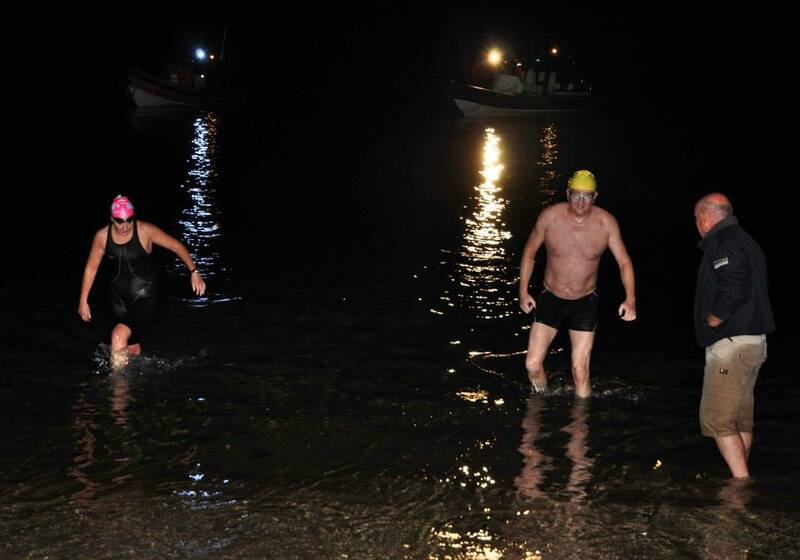 Then Carol Cashell offered to swim out from Robert’s Cove at about 6km from the end and do some swim support for the final leg. 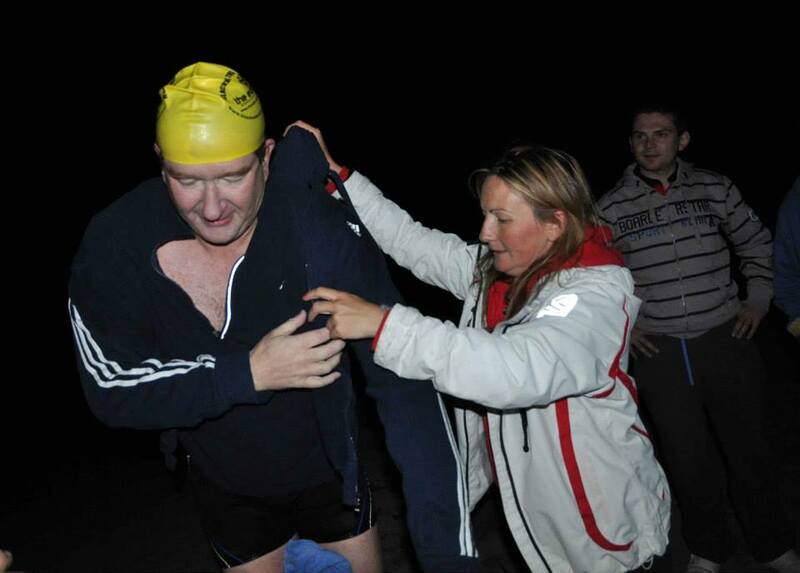 All we had to do was swim – safety and support was sorted. 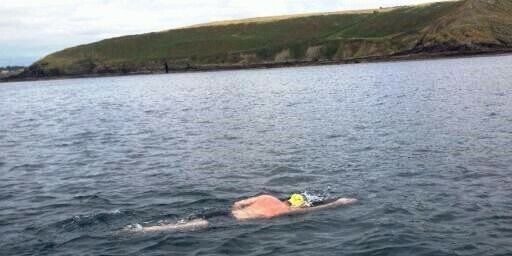 We loaded the boats in Kinsale and I made the mistake of putting sun cream on my forehead, so my hat kept slipping off for the whole swim. Just not thinking. 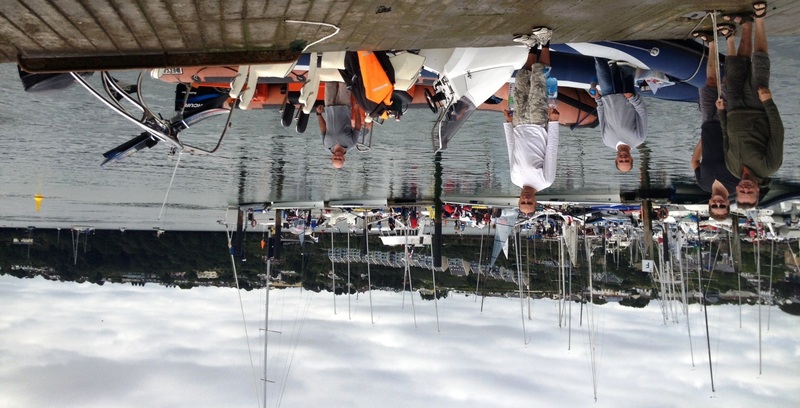 Loading in Kinsale – Billy, Damian, Bernard, Frank and Tom Lynch. We drove to Sandycove and I set off at about 1.20 – 2 hours and 40 minutes before the low tide. Bernard was following 30 minutes later. We thought that was a good plan. Unfortunately, the tides against us were much stronger than we expected and the first three hours were slow, slow, slow – even by my standards. Damian past Frower Point on the way to the Sovereigns – too far out! Bernard blew past me after about 90 minutes, looking smooth. Tom McCarthy estimates I covered only 6.5km in three hours. That lost me an hour on what I expected and meant I would be swimming in the dark at the end. Still, I got to see the Sovereigns again and the water was calm. Green light visible on the goggle strap: needed that later! From there on, we got a bit of tidal benefit and I started to move along. From the Sovereigns onwards, I held a really straight line, so was in a position to watch Bernard disappear into the far distance to my right, miles from land. No idea what he was doing out there, but he certainly wasn’t making it easy for himself. Tom and Billy went in for a look at the Astrid and as funny things go, met Tom’s brother, Frank McCarthy, also having a look at it. Small world out there on the water! At each feed, Tom or Billy did some fishing and I got to see the benefit of the Contigo bottle advised by Carol Cashell. It was fantastic – highly recommended. Preparing for the swim, I’d had a back-up plan to stop at Robert’s Cove and do an 18km swim, rather than risk not finishing at all if I went past Robert’s Head and committed to the last section to Myrtleville. That was a reasonable goal for someone in their first year in togs, I thought. I did mention that plan to Ned Denison, who helpfully advised that he didn’t want to hear any of that crap. So, when Tom left me know that Bernard was cold and talking about going in to Robert’s Cove, I asked him to pass on some gentle words of encouragement along the lines of Ned’s to me, only far less printable. 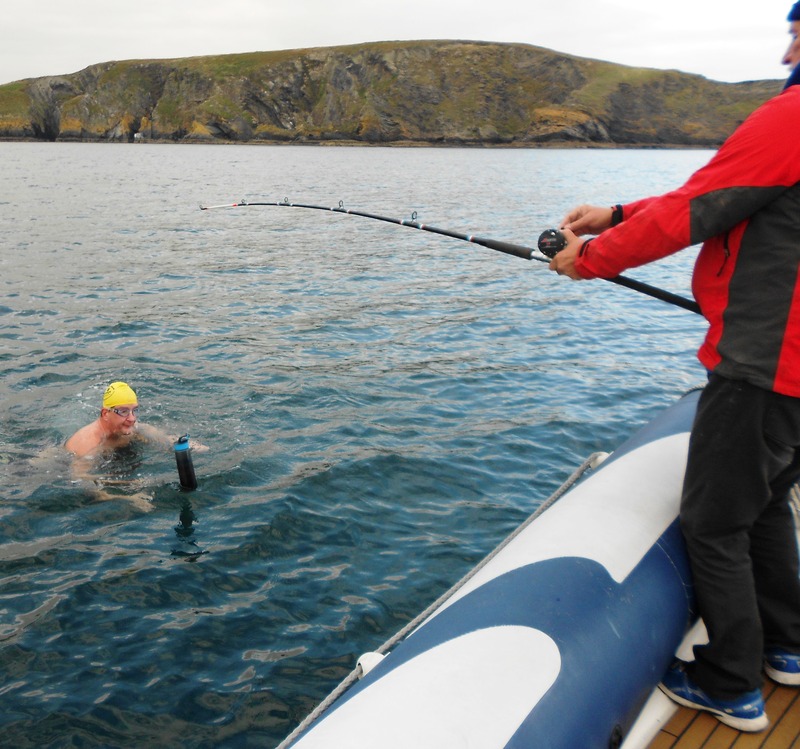 Bernard and myself had eleven months of thinking or talking about little else than this swim. The only expletive-free part of my message was that I wasn’t doing another year like that again. I might go short, but Bernard wasn’t allowed – that was not in the plan. To be fair, I had helpfully guaranteed him the water would be 16.5c or more, according to the buoy reports. It reached 15c for about 20 minutes, but mostly it was 14.2c or so for the whole thing. That’s not really very warm. At the last feed before Robert’s Cove, Tom asked me if I’d stop or continue. He told me Bernard had gone on, with Carol swimming out to meet him. I felt good. Not too cold, not too tired, comfortably uncomfortable – just right. The water was fairly calm, wind seemed ok. I was sick to death of the feeds – Maxim carbs, High5 gels with and without caffeine and SIS electrolytes – but I knew I could make two more hours, so I said I’d continue, as I reckoned it would take less than that. Ahhh feckit, not another gel…. Thirty minutes later I was cursing. The wind went to the NE, straight into my face, making sighting more difficult and slowing the pace down dramatically. No choice, though – if I stopped I had no valid swim, so I had to keep going. The big problem was the dark – I don’t see well at night with my prescription goggles. I headed for the lights I could see, but they weren’t on the right line that my boat was showing. Tom and Billy told me they thought I was in trouble and getting hypothermic as they couldn’t understand why I kept asking which way to go, but they relaxed when I was clearly lucid – just blind. 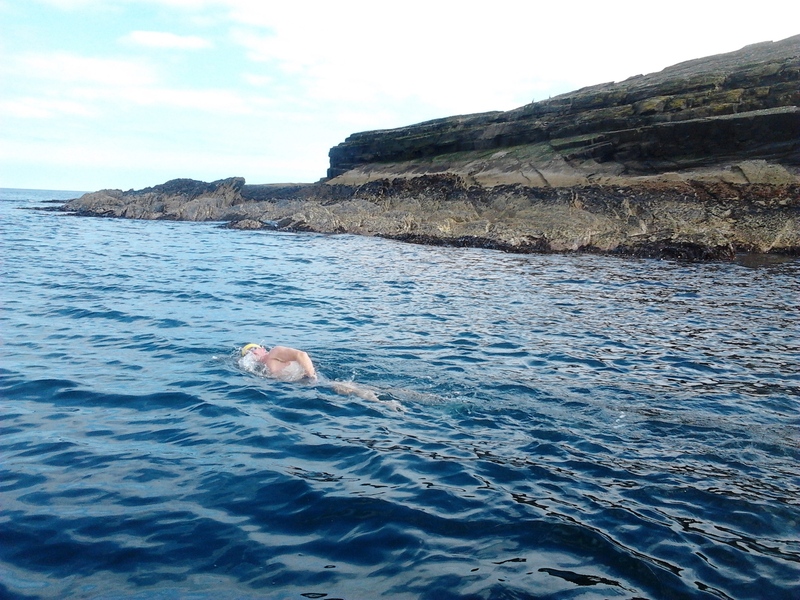 Bernard had finished and Carol came back out in the RIB to swim the last bit with me. She told me there was about thirty minutes left and off we went. I swam like a champion – she swam a doggy paddle or “old lady with her head out of the water” breaststroke, so I could see the light on the back of her hat. She was still faster than me. Depressing. About ten minutes later, I stopped again for a clear look and to confirm I didn’t want another feed as we were close to the end. Carol said “about twenty or thirty minutes left”…I couldn’t let that go. “You said thirty minutes the last time”, I complained. “Well, if you swam faster, you’d get there faster. Now, go.” was the reply I got. Carol is MEAN in the water. No problems with lights at that stage – spotlights on the RIBs, two sets of car headlights shining out from the beach and lots of torches. The water was flat calm once I went under Bunny’s and I could enjoy the last few minutes. Nine hours and six minutes from the start, I stood up. An hour more than planned. Delighted to see lots of swimmers and locals on the beach and Siobhan Russell, as ever, captured the scenes. Thanks to everyone – including my wardrobe assistant, Ger! 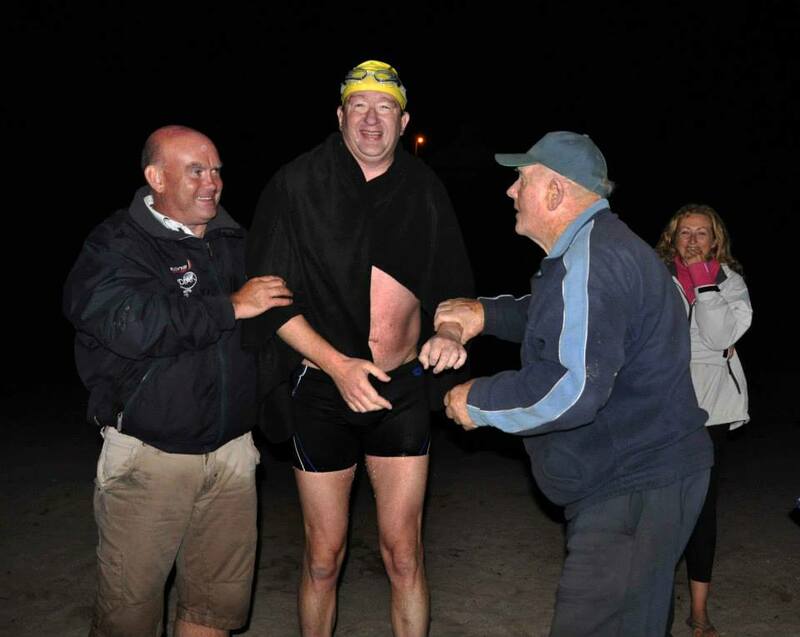 Ger Venner – ace post-swim dresser! 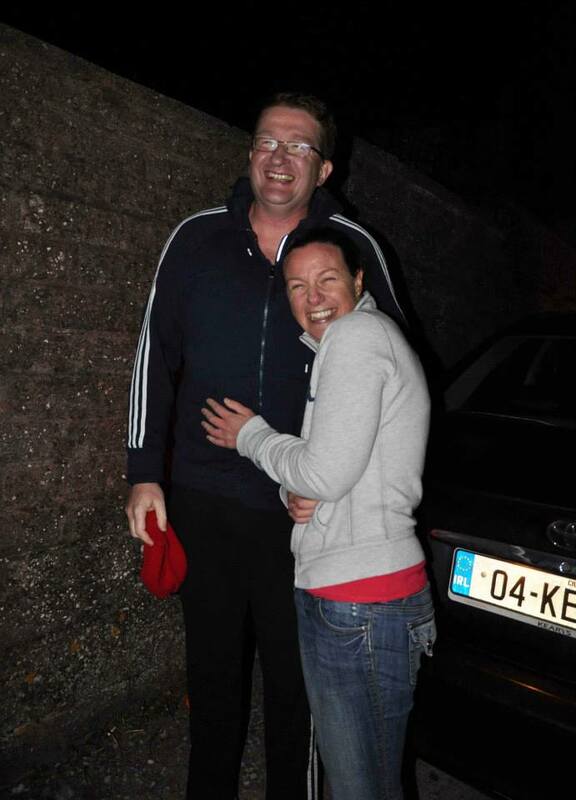 With Carol Cashell – all smiles once the swim is done….still MEAN. 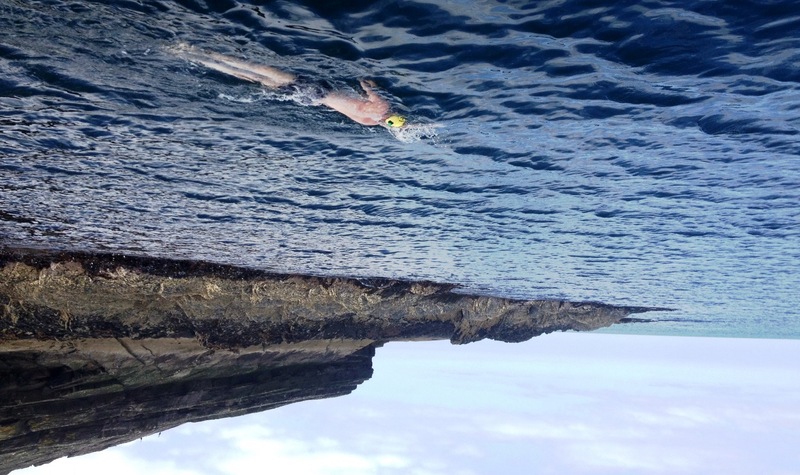 This entry was posted in Events and tagged Marathon Swimming, Open water swimming - Cork, Open water swimming - Cork - Ireland, Sea swimming - Cork, Sea Swimming - Cork - Ireland by myrtlevilleswimmers. Bookmark the permalink. Well done Damian – I wouldn’t go that far in a boat! Thanks, Seamus – there was a lot of project management involved: I’ve been watching your courses! Well done again Damien… I’m getting these crazy ideas in my head now for next year!!! Crazy is a good starting point. Lots of advice available whenever you want it. Delighted to play a small part for you both – well done again. Thanks, Carol. Best of luck to you on Saturday. Ps Its was the least I could do for you. Much appreciated, Ger. Can I borrow the Lego pirate ship though?